I may be biased, but West Virginia is one of the most breathtaking states during the fall season. With our curvy mountain roads and expansive valleys, no matter where you look you are guaranteed to see vibrant reds and burnt oranges in your vision. What I love most about fall in West Virginia though, is that it seems never ending. As a resident of Charleston, I have to wait until the end of October for colors to be at their peak — and trust me, it makes for one amazing Halloween! However if I find myself getting impatient, all I have to do is travel to higher grounds and I am able to enjoy the foliage sooner as higher elevations like Canaan Valley and the Highland Scenic Highway are already beginning to change colors (if you want to capture the sought-after Dolly Sods crimson photos we often see, the window is quickly closing). West Virginia’s diverse elevations allow us to enjoy fall colors from mid September all the way through early November. You just have to know where to go and when to visit. That’s where the beauty below comes in. 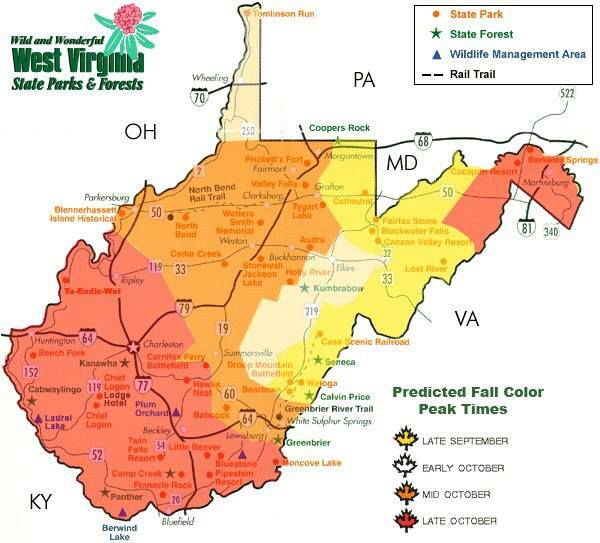 If you’re interested in taking a road trip in the Mountain State this fall to see the array of colors, the West Virginia Division of Tourism has created this handy map that displays the peak color times. In my experience, I believe this map is fairly accurate. Of course, exact time frames for peak foliage greatly depend on the weather in August and early September but as a general rule, if you plan your foliage trips according to this map, you should be right on target. Have fun and safe travels!